Officials probing the crash in Ethiopia of a Boeing 737 Max have preliminarily concluded that a flight-control feature automatically activated before it crashed, the Wall Street Journal says. The newspaper, citing unnamed sources, says the findings were relayed on Thursday at a briefing at the US Federal Aviation Administration (FAA). The flight-control feature is meant to help prevent the plane from stalling. Thursday also saw what is thought to be the first lawsuit filed on the crash. The Manoeuvring Characteristics Augmentation System (MCAS) flight-control feature was also implicated in a fatal crash by Lion Air flight in Indonesia last year. Together, the two crashes have claimed 346 lives. 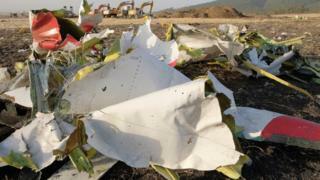 The Wall Street Journal says the preliminary findings from the “black box” recorders of Ethiopian Airlines Flight 302 are subject to revisions according to the people briefed on the matter. A preliminary report from Ethiopian authorities is expected within days. On Thursday, a lawsuit was filed in Chicago federal court by the family of one of the victims of the Ethiopian crash, Jackson Musoni, a citizen of Rwanda. It alleges that Boeing had defectively designed the automated flight control system. Boeing this week issued changes to MCAS. As part of the upgrade, Boeing will install an extra warning system on all 737 Max aircraft, which was previously an optional safety feature. In a briefing to reporters, Boeing said that the upgrades were not an admission that the system had caused the crashes. All Boeing 737 Max are currently grounded. It is still not certain when the planes will be allowed to fly.